Ethan Lord Jewelers specializes in creating the kind of custom jewelry that Chicago customers can use to commemorate their most special moments. If you’re about to propose, celebrating an anniversary, or just looking for the perfect piece in which to surprise someone, you’ll find it when you come to us. As the Chicago jewelers that offer both ready-made and custom engagement rings, we’re here to help you find or create just the right ring when you pop the question, mark an event or have something to celebrate. We offer wedding bands, anniversary bands, engagement rings, necklaces, bracelets and more. All our rings are handcrafted right at our location on Jewelers Row in Chicago, sustainably manufactured from eco-friendly materials. Let us be the jewelers you choose for anniversary, wedding or engagement rings in Chicago that become precious family heirlooms. If you’re still trying to determine what you like, explore our selection of halo engagement rings, sapphire engagement rings, men’s and women’s wedding bands, three-stone rings, necklaces and more. 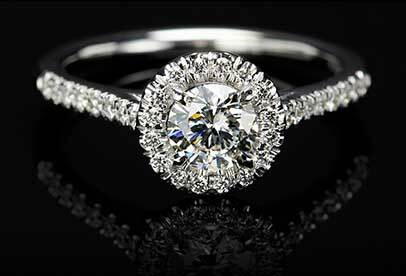 We use only the highest-quality diamonds, whether you’re interested in a round cut or a princess cut. While Ethan Lord Jewelers offers both ready-made rings and rings that can be tweaked to your tastes, we also specialize in custom jewelry and engagement rings that are designed and manufactured to your specifications. Tailor a ring to your tastes and get it manufactured with our state-of-the-art technology and eco-friendly materials. We work with yellow gold, rose gold, palladium, platinum and other materials, creating everything from unique anniversary bands to vintage-inspired engagement rings in Chicago. Located in the heart of Jewelers Row on Wabash Avenue, Ethan Lord Jewelers is the perfect place to create stunning, custom jewelry in the Windy City. From bracelets to wedding bands to pendants and beyond, we offer breathtaking jewelry that stands out and makes an unforgettable impression. Come to us, and we’ll take the time to get to know you and your desires so we can create just the right finished piece to meet your needs. 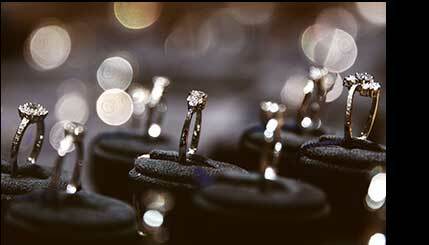 At Ethan Lord Jewelers, you can choose your setting, stone and design for the ultimate in customization. Whether you’re ready to propose to the love of your life or you’re looking for the perfect gift to mark an anniversary, trust us to help. Contact us today to learn more about the unbeatable jewelry available through Ethan Lord Jewelers. From our location in Jeweler's Row in Chicago, Ethan Lord Jewelers offers more than just beautiful jewelry — we offer the power to create stunning, sustainably manufactured, eco-friendly pieces that will last a lifetime. Choose your setting, stone and design in order to know you’re getting exactly the jewelry you desire. If you’re looking for a ring to surprise your future bride or a pair of earrings to mark a special occasion, look no further than Ethan Lord Jewelers. We're here for your every jewelry need. Browse our jewelry selection, or contact us today to schedule a consultation with one of our experienced jewelers. Or stop by our Chicago store!